Google has announced it has buffed up its Google Sync service to now include push Gmail. 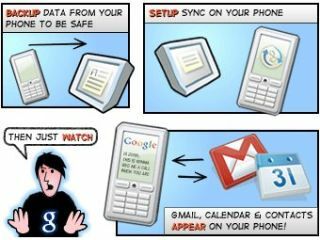 Google has previously made the Sync service, which uses Exchange ActiveSync to automatically update items as they change, available to S60, Windows Mobile and iPhone users. However, this was only for Google Calendar and contact updating, and now Google has extended the service to include Gmail as well. While this means instant email updates for Gmail users, the big G is currently not supporting S60 devices, so Nokia smartphone owners will have to kick their heels and wait a few more minutes for email. Apple has already approved such an application for the iPhone – Gpush – to achieve the same thing, but now Google can offer it from within the iPhone's software. Apple updated the iPhone's software to allow push email in the recent 3.0 firmware release, but companies have been slow to make their services compatible. And Windows Mobile has had push support for years, so it's good to see Google is finally powering up its email service to be more compelling for business users (providing it doesn't crash). Head on over to m.google.com/sync to enable your phone for push Gmail, and let Google know what you'd like to see next while you there, as it says it currently all ears for new suggestions.